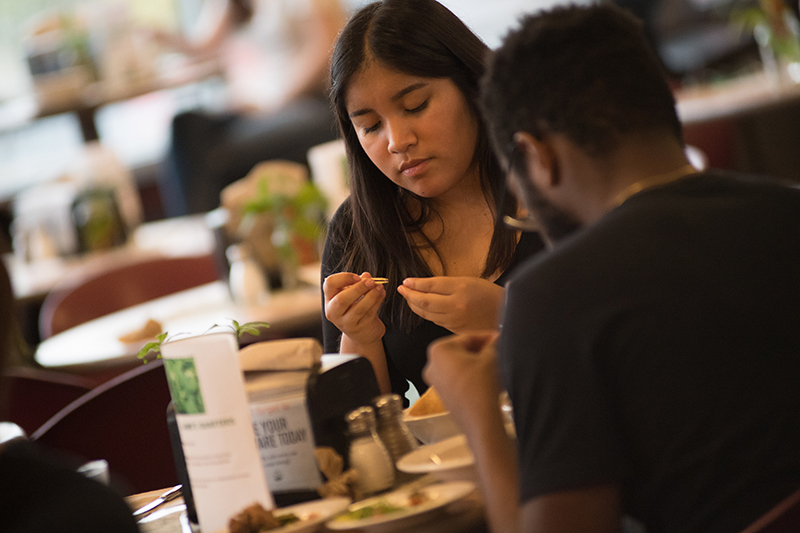 Students arrived at a UVM dining hall on a recent Tuesday evening, and, like any other night, they perused the offerings and returned to their tables with small plates. They sat with their friends, chatted about classes, and laughed, but this was no ordinary meal. Every dish shared a common element: they each featured an invasive species as a primary ingredient. The plates, colorful and artfully arranged, evoked a tapas menu at a gourmet restaurant: pan seared marinated perch served in a house made taco bowl and finished with a Tequila pineapple salsa. 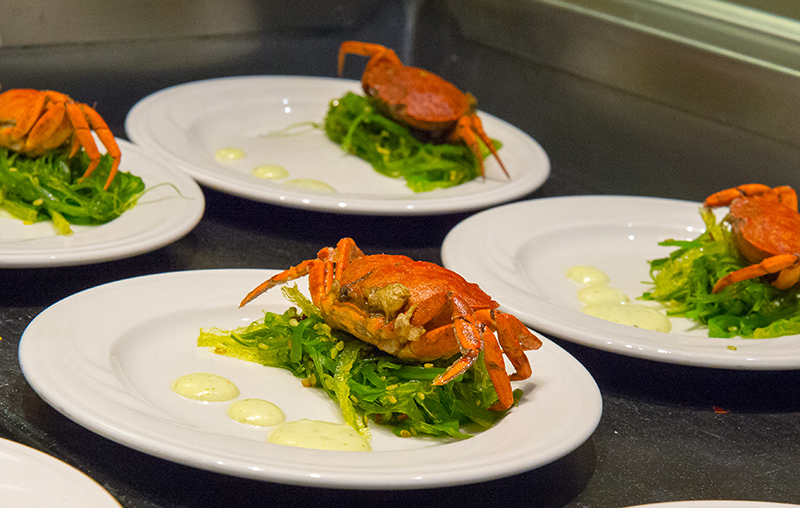 Green crabs, dipped in a seasoned flour and fried whole, nestled over seaweed salad and paired with Wakame garlic aioli. A salad featuring dandelion greens, arugula, watercress, carrots, beets, and fiddleheads with Tomme cheese with a prickly pear vinaigrette. Sweet wild boar, slow roasted, pulled, and glazed in a maple apple reduction, served with pickled mustard greens and paired with a whole-grain maple agave mustard. And finally, the periwinkle pappardelle: periwinkles (marine snails) poached in white wine served over VT Fresh house cut pasta in clarified garlic butter. Every dish was a hit. “We pretty much sold out, with nearly five times the expected participating count!" said Eric Caravan, executive chef of Harris Millis Dining. “I’m impressed by how much people are willing to try,” said Joe Roman, a conservation ecologist and research associate professor at UVM, whose work provided the inspiration for the event. Roman is the cofounder of eattheinvaders.org, a website devoted to educating people about edible invasive species and sharing recipes for preparing them into tasty meals. Invasive species thrive when they do not have a natural predator, so the idea behind eating them is that human consumption can help keep non-native populations in check, thereby supporting the health of native ecosystems. Researchers note that this approach may be more successful for some species than others, and that creating profitable markets can run the risk of encouraging the propagation (rather than eradication) of problem species. While a gastronomic solution may not be a silver bullet, it can help raise awareness and direct attention to alternative management strategies. 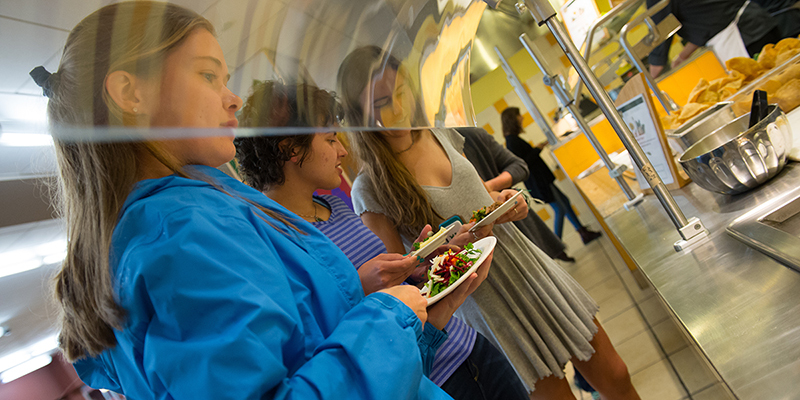 Although the dinner was a one-time event, UVM Dining sustainability manager Emily Portman says it was a trial run of sorts. “We were curious to see how students reacted,” she said. Going forward, Chef Caravan and his team will be integrating some of the ingredients into their rotating menu, and sharing their experience with other chefs across campus. Red’s Best, a fishermen’s cooperative out of the Boston area, supplied the green crabs and periwinkles for the event. Mary Parks, who manages environmental compliance and outreach for the co-op, was on hand with some live green crabs to prompt conversations with students. Some stopped by the table to pick them up and talk with Parks, who highlighted that UVM is on the cutting edge by incorporating them into the student dining experience. And it’s not just the green crabs. “As far as I know, this is the first time a university dining hall has offered a meal focused on invasive species,” said Roman.